Make sure your shells are clean. Rinse as many times as you have to, to get them clean. Cut the shallots and grate or press the garlic. Cut the parsley. Heat a pot of water with salt to boil the spaghetti and cook the spaghetti al dente. Heat about a half a cup of olive oil in a pan and gently simmer the garlic, shallots and the pulverised chilli in it until tender. If your spaghetti is not ready yet, then take the pan of the heat until about 5 minutes before the pasta is ready. Add the clams to the pan with the olive oil and shallots and heat until all shells are open. Put the lid on so you steam the shells to open them. 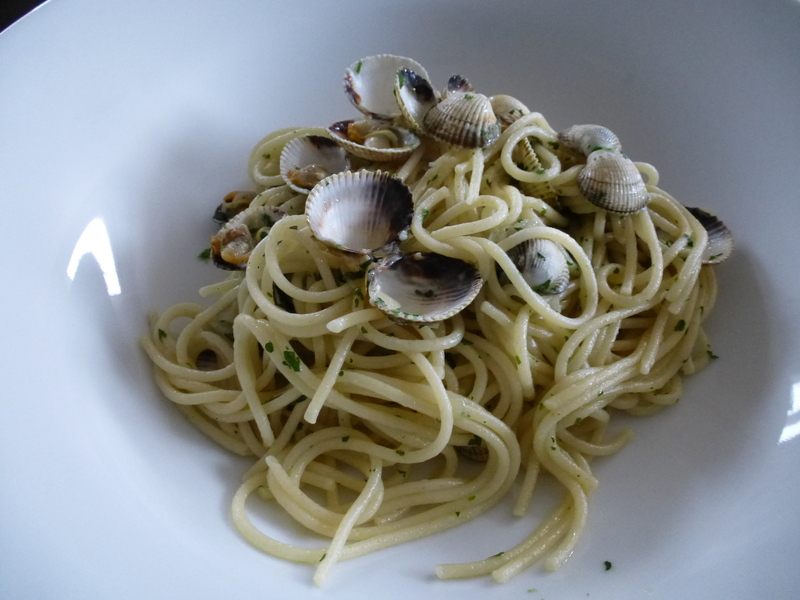 When the pasta is ready, take it out of the cooking water with kitchen tweezers and add it to the pan with the clams. Add parsley and mix everything gently. Serve is a deep dish. The golden advice is to rinse rinse rinse rinse… and rinse the shells until no sand or dirt is in the water anymore. Hateful it is when you are enjoying these delicacies from the seas and hear the sand grind between your teeth. Don’t be dispirited if you have difficulties finding clams or cockles, you can surely find some shells to replace them, even mussels will work great. Olive oils can have a very distinct taste. Taste your olive oil(s) beforehand to see if its taste is not too dominating, since you are using a lot of it in this recipe it can really start defining the dish’s taste. Less is more! Keep it simple, it will make everything better. 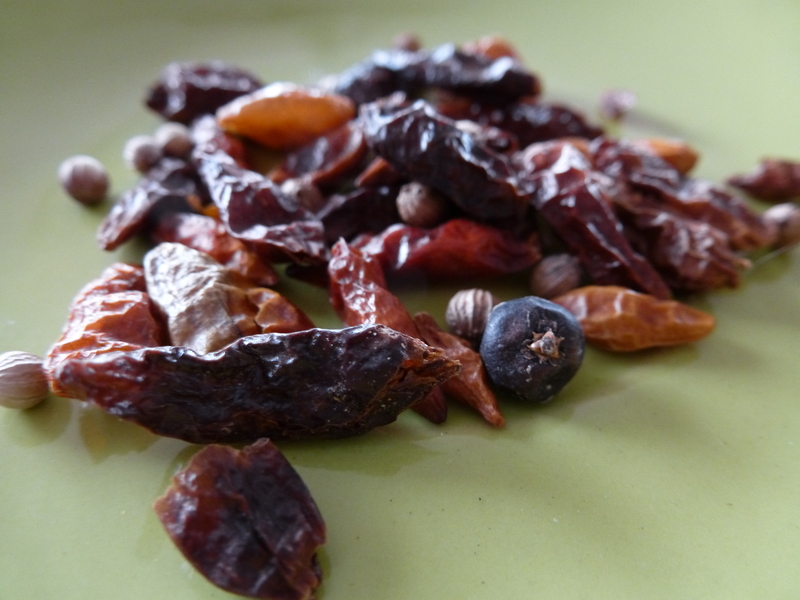 Our secret ingredient is the small dried chilli which we add to give the dish more pit. This recipe is definitely fusion cooking. 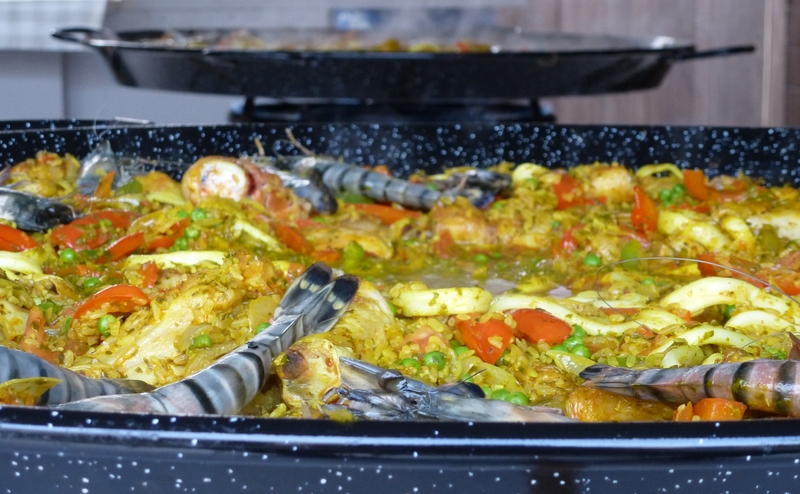 We will not claim this is real Spanish paella, but it is definitely our Flemish best effort. Between ‘90 and ’93 we lived in the area of Mons, a city where there used to be a lot of coalmines. Because of the mines, in the area there are still a lot of Italian and Spanish families. 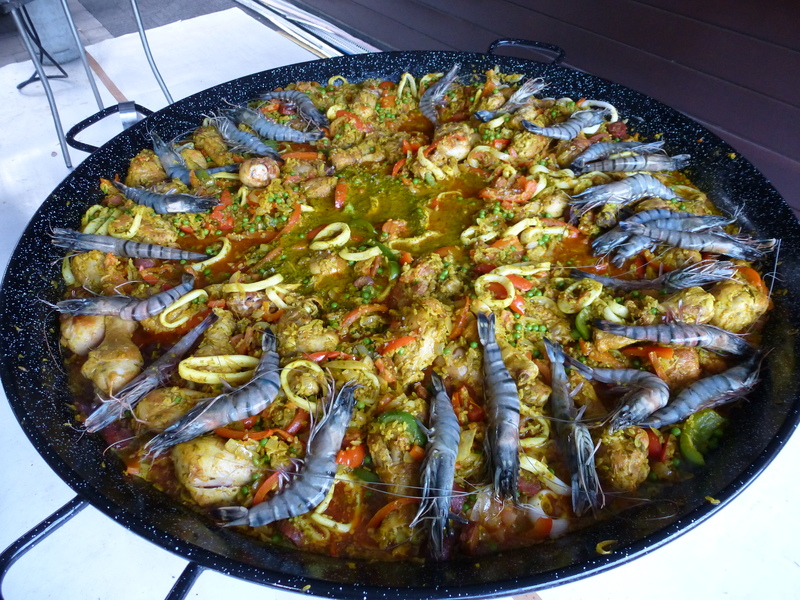 It is during that time that we tasted our first paella. In an attempt to try this at home we looked up the recipe in a Belgian cookbook and tried this in a normal pan. It was disgusting; it didn’t even come close to what we had tasted during our local night out. We weren’t easily discouraged, so we made a couple more attempts, all without success. So what was the secret? Why didn’t we succeed? As I traveled to Spain and to Portugal in my job as a software trainer, my husband said ‘do not come back without a paella recipe’. A good idea it was, but the people I had to train were mostly men. Each time I popped the question ‘Can you tell me how to make paella?’ Each time i got the same answer ‘I don’t know, my mother makes this for my family’. Okay, this definitely gave a new start to our wrong footed paella project. 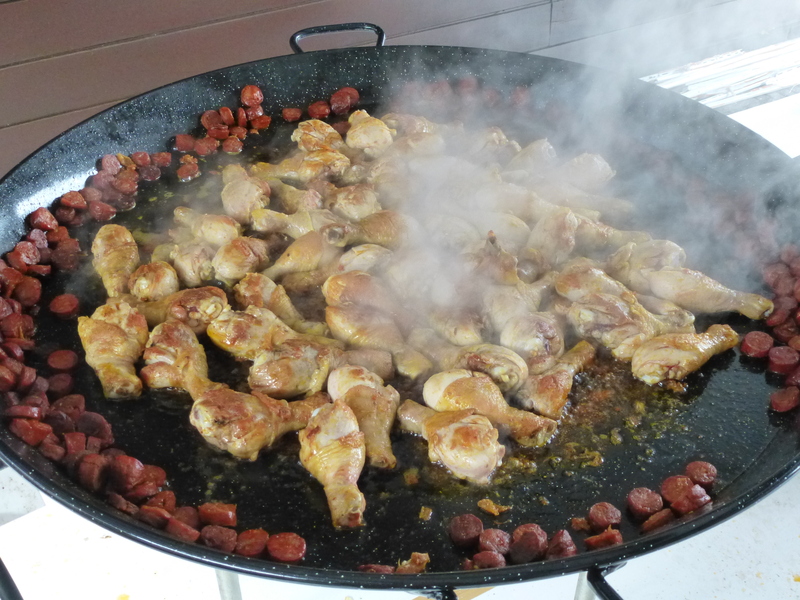 We went out and bought our first paella pan for 10 persons. Later, as we became better at making it, we bought one for 25 and later one for 50 persons. I don’t remember how close this original recipe came to how we make our paella today, but what follows is the result of many tries to get it exactly right. 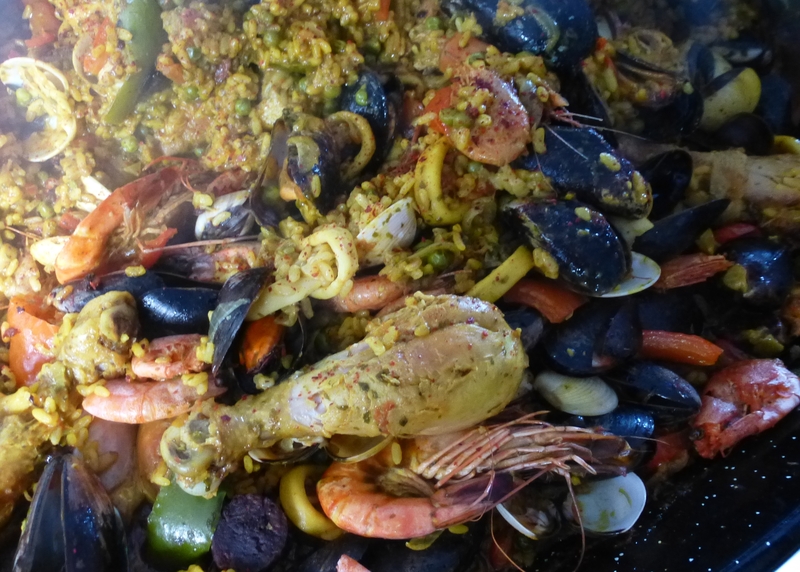 Because paella is often made in larger quantities, telling you how much of each ingredient you need is difficult. How many people would you like to feed? 5, 10, 25, 50, 150? So the approach here will be different than in my other food blogs. I will post a recipe list and the ingredients for 5 persons. If you have other quantities, we developed a spread sheet to help you with the shopping list and calculate the cost. Make sure ingredients are cleaned or rinsed. Keep all your ingredients separately. Cut the onions. Remove the seeds of the paprika and cut them into pieces. Peel the tomatoes and cut them in small cubes. Cut the lemon in parts. Remove the skin from the chorizo and cut in 1,5 cm rounds. Cut the cleaned squid into rings. If you have frozen fish, make sure to defrost them before cooking starts. Clean the mussels by removing the beard and any dirt on the shells and rinse them several times. 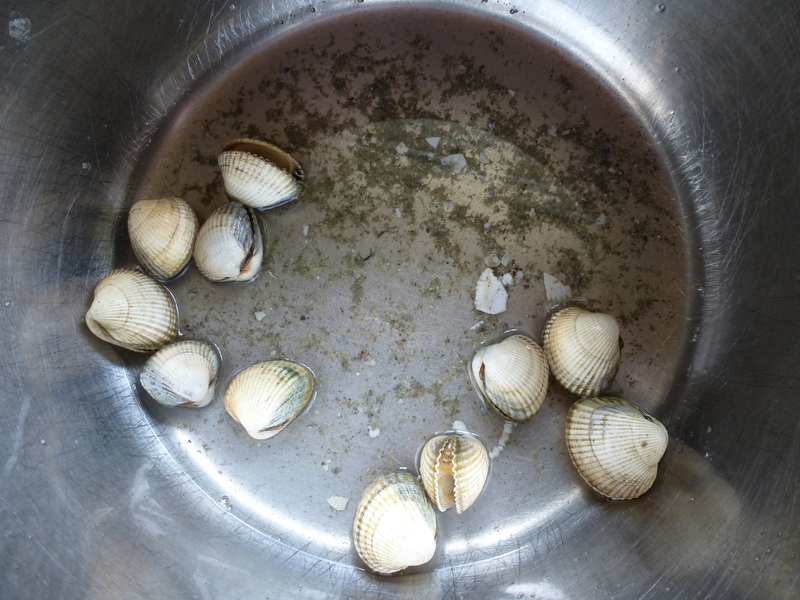 Put the clams in a bowl of water with some salt, afterwards rinse them several times. Throw away all clams and mussels which are open. Put the garlic with some olive oil in a blender and blend until you have paste. Prepare the stock adding the cubes to the water, adding the parsley, curcuma and saffron. Gently boil this in a separate cooking pot in order to mix all flavors. We like to add some extra salt, pepper and dried chilly to give the stock some punch. When all ingredients have blended together, you can put the stock aside until you need it later. Now the prep work is done, we can start with the real job. Heat up the olive oil and bake the chicken legs until they are browned, also add the chorizo. When done, move the chicken and the chorizo to the outer circle of the pan, and turn down the heater for that outer area. This will take about 10 to 15 minutes depending on how big the pieces of the meat are. If the chorizo starts to brown too quickly, move them to the outer circle. In this stage you can spoon out some oil and chicken fat out of the middle area, keep it to be used later. Now you have an open space in the middle. Put the garlic paste and simmer for a while. Do not let it brown! Add the onions and paprika and let these soften gently while stirring from time to time. Move this to the outside, and let the water evaporate until you have only oil. The following step is to add the rice in the center and let it glaze in the oil. At this point you can add some saved up oil again if necessary. 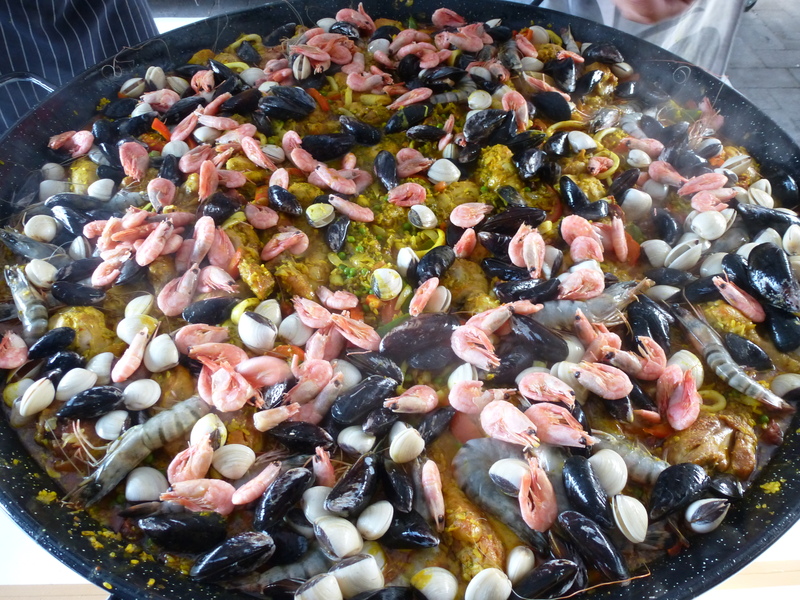 Put on top of the paella the clams, the mussels, the gambas and the shrimps and cover the pan with aluminum foil. Let it all cook gently just checking that it does not burn. After about 10 minutes you are allowed to stir everything once and check again that it does not burn. Reduce the heat if needed by cutting it completely for a while. Cover again with aluminum foil and let it cook gently for another 10 to 20 minutes until the rice is done and the mussels are open and all shrimps are nicely red. Serve with a piece of lemon on top. Anyone can make paella. It is not difficult; just stick to some simple rules. In all stages of the cooking process it is important to control the heat well. 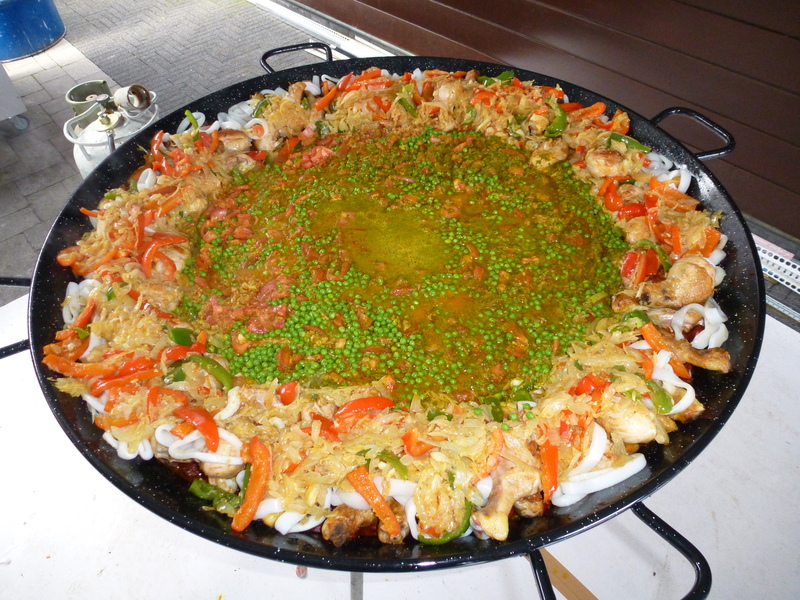 Ideal is a paella pan heated with a burner with different circular sections. Make sure your pan is a 100% level. Nowadays every smart phone has a level app you can download free of charge to check. The biggest danger is wind, as this will make the heating less controllable. 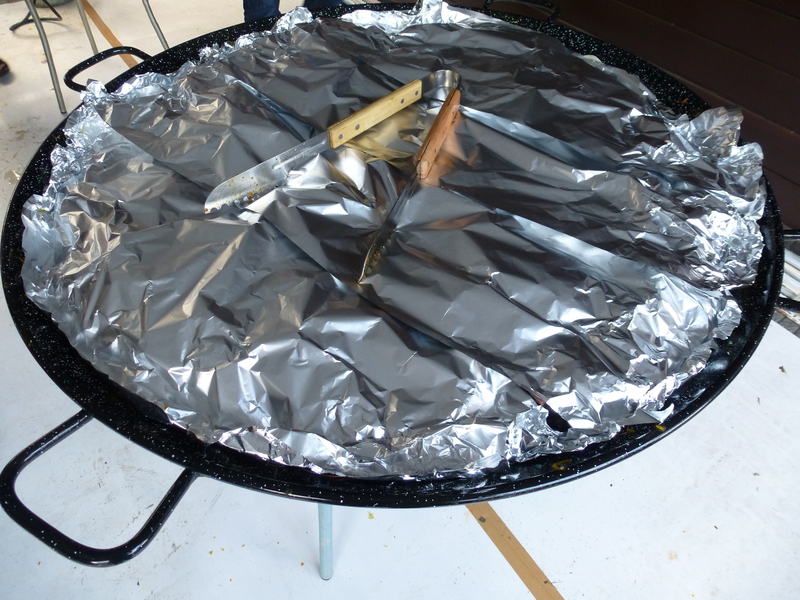 If you need to cook in an open area, wrap some aluminum foil around the pan so the wind cannot play with the flames. Wash and clean the mussels. It is very important to wash the mussels in plenty of water multiple times to make sure all sand and dirt is gone. As you poor the fresh mussels in a basin with ample water to rinse them, the mussels which do not sink to the bottom or remain open are the ones which are bad. So throw those away. After cleaning the mussels, leak them out for a short moment in time. Fold a long leaf of aluminium foil double lengthwise. The idea is to make bags for the mussels, so you need a length of about 30-40 cm. Add a handful of mussels in the centre of the foil. Fold the foil as if you will close it as a bag, so that a pit is formed to capture the ingredients and liquids which you will start adding to the mussel-bag. In each mussel bag sprinkle some onion, some celery, some leaf parsley and optionally some garlic. Poor in the bag some white wine – a bottom will do since the mussels contain enough water in their shells to cook them. Sprinkle some of the crunched fish stock cube in each bag and add salt & pepper. Now close the bags smartly. The bags should be easy to grip with the barbecue tongs and all the moisture should remain in the bag until serving. It’s a challenge the first time, but once you’ve thought about it, I’m sure you’ll fold your own favourite bag shape. When the bags are closed you can put them on the BBQ. Since no BBQ has equal fire everywhere, you should move the bags half way through the cooking time. Move the bags on the outside of the fire to the inside and vice versa. A mussel only needs 10 minutes to cook. Out of experience we know it takes a bit longer on the BBQ, but it will depend on your BBQ on how long they will need before done. Cooking time may easily go up to 20-30 minutes, depending. The solution is to peek from time to time. 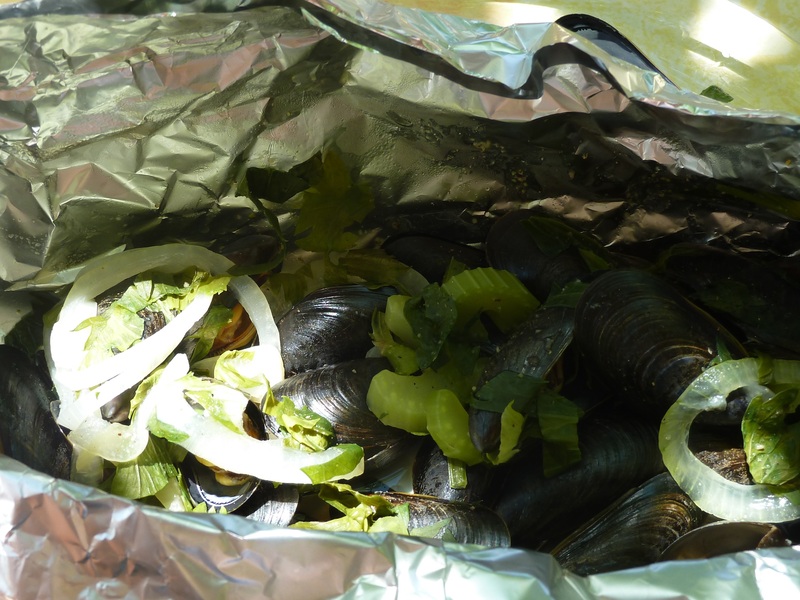 Take a bag from the fire, open it carefully and look if all the mussels are open and they don’t look glazy anymore. If some of the shells are still closed, close the bag and put it back on the fire for 5 minutes and repeat the sneak peek process. Put the bag on a plate and serve with a piece of lemon on the side and brown bread. Let your guests discover the content of the bags themselves. The aroma escaping of such a bag is delicious. The cooking juices are great for dipping a good piece of brown bread. Be careful, if you serve with bread some of your guests will turn this starter into a main course. In summer time this makes a great light lunch. Don’t look for the largest mussels. The small French Bouchot mussels are much more tasteful and are often less expensive than the larger ‘jumbo’s’ which are reserved for restaurants. Handle the aluminium bags always by lifting them up vertically. Don’t shove them over the grill; this will damage the bottom of the bag and let the cooking moisture escape. It is exactly that juice in the bag which steams and flavours the mussels. Do not be tempted to put too many mussels in a bag! You can develop many nuances to this recipe flavouring the mussels to your personal or regional taste. For instance you can add a slice of lemon in the package, or a drop of Ricard (anisette), or add some extra spices or herbs, or replace the wine with beer…these are only a handful of ideas. Cleaning up after a mussel diner is not the nicest job. If everyone closes the packs again after eating, you can punch some holes in the bottom of the bag to leak out the left over juices. After some time, press out the bags and put them in the bin. Smear the chicken richly with the chicken herbs. Make sure you throw a lot of seasoning inside the chest cavity and be generous with the herbs. Melt the butter in a cooking pot and bake the chicken brown on all sides. By the time the chicken is nicely browned, your fat will be burned and blackened. Take out the chicken, put it aside, get rid of the burned fat and clean the pot. Put the pot back on the fire and add a small cube of margarine, let it melt and put the chicken back in. Season with salt & pepper. Add a half a cup of water. You should have about 1 cm of water in the bottom of the pan or pot. Crunch the cube of chicken bouillon and sprinkle it around the chicken in the water. Close the pan with a lid and reduce your hot plate to a very weak fire. The water should boil softly to make the steam in the pot. Leave your chicken like that for 45 minutes to 1 hour, take a peek from time to time to see if there is still a bottom of water. In case the water dries out, add some more. 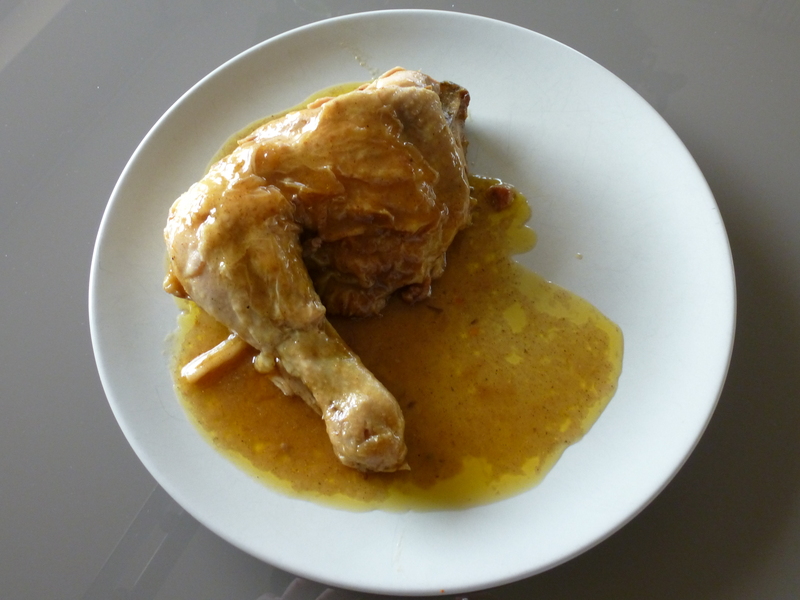 By the time the chicken is soft and done, a syrupy sauce will develop automatically based on the water, the bouillon and the fat coming out of the chicken. ET voilà, you made a chicken to impress. I invented this recipe by accident because i simply don’t know how to brown a chicken without burning the fat. The chicken herbs will determine the taste here. In Belgium and Holland I know you can get ‘Verstegen kruiden’, for me they are the best. But feel free to leave your comments on your local good seasoning providers. Don’t forget to add your country or region. Each time I am amazed how fantastic this naturally developed sauce tastes. Even simpler than the recipe are the belonging tips. If you don’t want to wrestle with a whole chicken, this magic works as fine with chicken legs as well. You can throw in a half onion at the bottom of the pot or extra herbs to spice up the sauce. But the recipe doesn’t need it at all. I tend to use Soya baking fat, since it has no effect on the outcome of the total taste, and I’m always looking to cut some calories. The favourite Belgian way of serving this is definitely with apple sauce and cooked potatoes. And last but not least… even if you are a novice cook, this will work like a charm! truffle or 3 tbsp. truffle oil. First thing to do is to drown the dried mushrooms in lukewarm water. They need to absorb water for at least 15 minutes. After 15 minutes (or longer) you drain the mushrooms but make sure to collect the brown water in a small cooking pot. Add the wild bouillon paste to the liquid and boil it down until it is really concentrated. You need a small cup of condensed liquid at the end of the process. In the meantime, heat the oil and the butter in a pan and add the pressed garlic. Fry for a couple of minutes but make sure it does not get brown. After 3 minutes you add the drained mushrooms. Stir each time you add something, to mix the ingredients. After another 3 minutes add the ham, and after another 4 minutes add the chopped tomatoes and the passata. Season the sauce with pepper, salt and truffle or truffle oil. Let the sauce cook softly for 15-20 minutes. When the condensed stock is ready, add it to the sauce as well. Optionally add cream to the sauce a couple of minutes before the end of the cooking time; always do this on low fire. Cream should not be boiled. Cook your pasta al dente. Mix the pasta with the sauce and serve with some parmesan on top. The reduced mushroom liquid is the secret of the success here. Take your time to reduce the liquid, it will make a huge difference. You can make this recipe with real truffle and real fresh cep. Both are really hard or even impossible to find in a suburban town like ours and also influence the cost of this diner a lot. The truffle oil and dried cep are much easier to come by and much easier in your pocket. We have a disagreement at home about using cream or not in this dish. OK, it adds extra fat to the recipe, but also smoothness in taste. The small picture is without cream. Try it out to find out your personal preference. 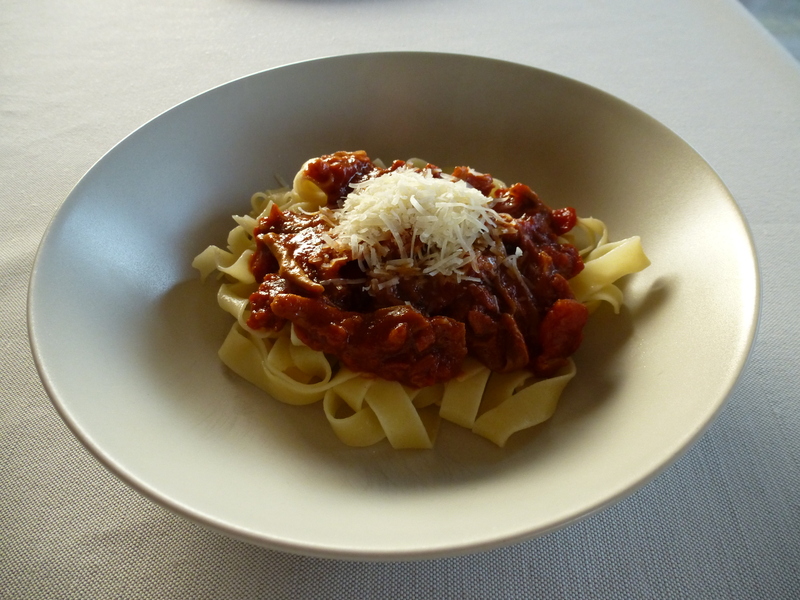 As you can see in our pictures, if there is no pappardelle in the house, another pasta will do fine. When preparing the trout like this, it just makes me feel i’m in a sunny country. So yes, i invented the name. Cooking time: 20-45 minutes, depending on the size of the fish. Peel the tomatoes, remove the seeds and cut them into small pieces. Heat the oil in a pan and fry the grated or pressed garlic for a short while. 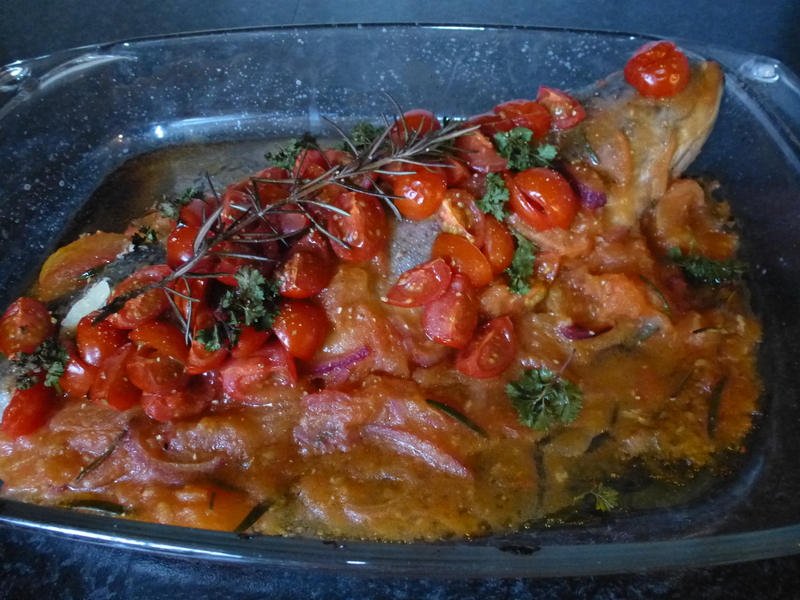 Add the tomatoes with pepper, salt and almost all of the rosemary. Leave just enough rosemary to decorate the oven dish later on. Cook until the tomatoes melt into a sauce. 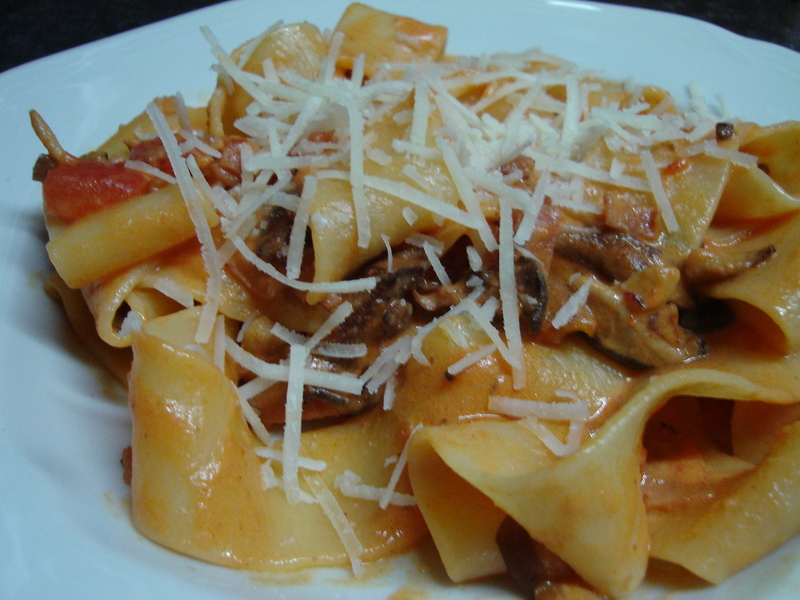 Pieces may still be visible; the sauce should not be overly done. Taste the sauce and add lemon juice and extra seasoning to your liking. Wash the trout’s and put them in an oven dish. Add some salt on the fish’. Cover the trout(‘s) with the sauce. Certainly working with winter tomatoes in our country, we sometimes boost the tomato colour & taste by adding some extra halved cherry tomatoes on top. 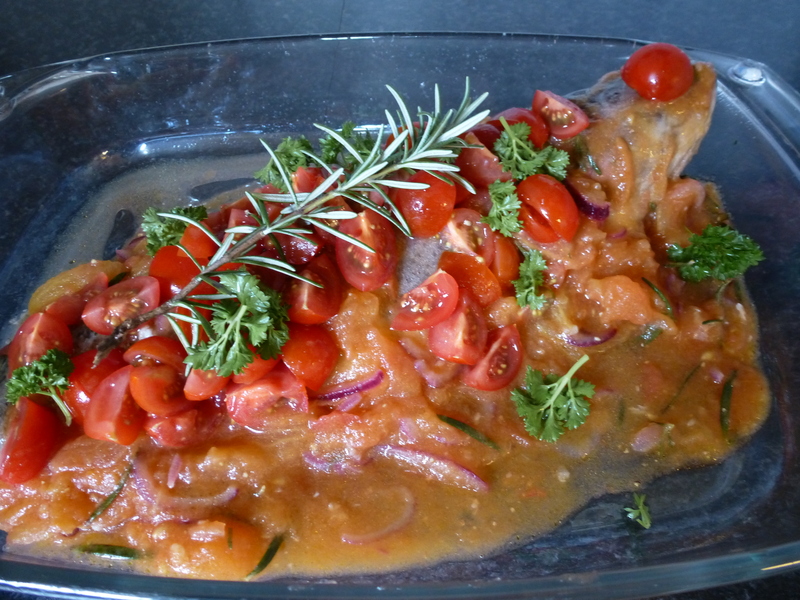 Add the left rosemary on top of the fish. Put the dish in the oven. For small trout’s you’ll need about 20 minutes. For a larger trout like our rainbow trout in the picture, you’ll easily need 30-40 minutes. You’ll have to keep an eye on them. Once done, sprinkle the cut parsley on top of the dish to add extra taste and colour. Only one secret here, my husband caught the fish this time all by himself. Serve this with jacket potatoes, boiled potatoes or rice. Anyway, this makes me think of summer in the sun. Wash the zucchinis and cut them in 2, lengthwise. Steam the courgettes until they are just done. Don’t overcook them at this time, they still need to go in the oven for a while. Put the meat in a bowl together with the seasoning. Cut the onion and the pepper extremely fine, press or grate the garlic, and mix all of this with the meat. I just use a fork to mix it all together. When the courgettes are steamed, take out the seeds of the zucchini with a spoon. By doing this you create a small gutter for the meat. This does not have to be too deep, otherwise your zucchini will lose its strength and you may run into trouble serving it. 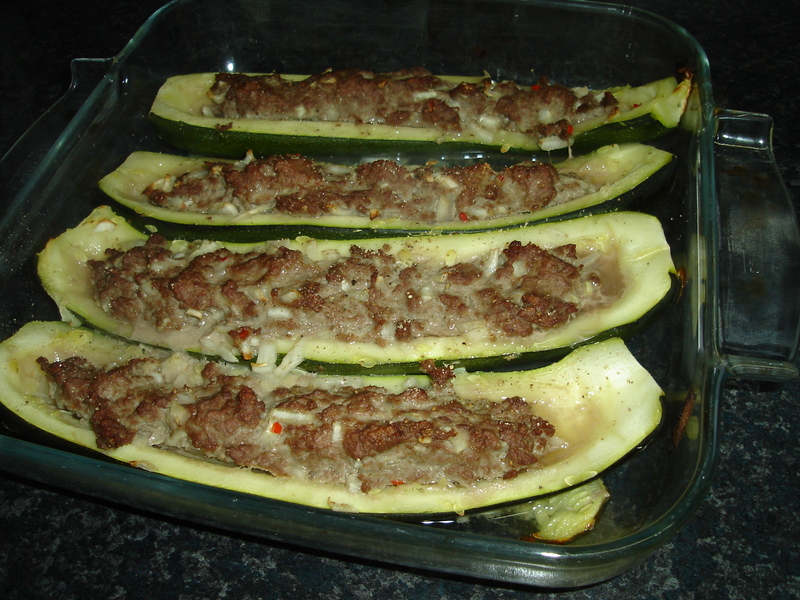 Once you’ve filled the courgettes with the meat mix, put them in an oven dish and cook them for 20 minutes in the oven. Check if the meat is not red anymore to figure out cooking time. We serve this with a jacket potato with sour cream. This is also an ideal recipe when you’re trying to avoid calories. You can easily make a calorie friendly version limiting the meat to 100 g per person and serving the potato without the sour cream. You probably also have days when you think ‘what am I going to cook tonight?’ or ‘what are we going to eat this time?’. Since i often have to go out for business diners, I have taken the habit of asking people – when appropriate of course – what they like to cook or what their favourite dish is. It also starts up the conversation again, when everybody start to get tired talking about work items. It has inspired me quite often and brought the greatest ideas to the table. The recipes handed over like this often shined in simplicity and great taste. Looking for inspiration one day, I popped the question during work lunch with colleagues ‘and what would you like to eat tonight?’ One of our engineers said… ‘it’s nothing fancy but at least I can cook this for my wife…’ and he explained about his stuffed zucchinis. 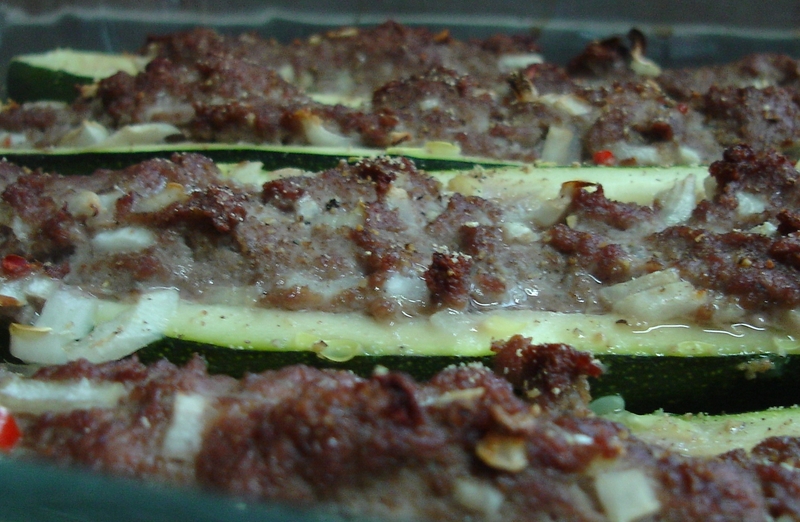 Since then, thanks to Jürgen, the stuffed zucchinis are a returning item during lean weekdays . Peal the tomatoes, take out the seeds and cut them in pieces. Take out the seeds of the paprikas and cut them up as well. Cut the white of leak, the carrots and the shallots in small cubes. Put all these vegetables in a cooking pot. Add 1 L of water, the 2 cubes of bouillon and let boil. Once the soup boils, turn lower the heat so that the soup boils softly for the rest of the cooking time. The paprikas will need about 45 minutes until they are tender. To strengthen the taste of the soup, add some spoons of tomato paste at the end of the cooking time and stir until the paste is melted in the soup. Mix the soup using a mixer or blender and add some extra water if necessary, to give the soup the right consistency. Season the soup with salt and pepper. 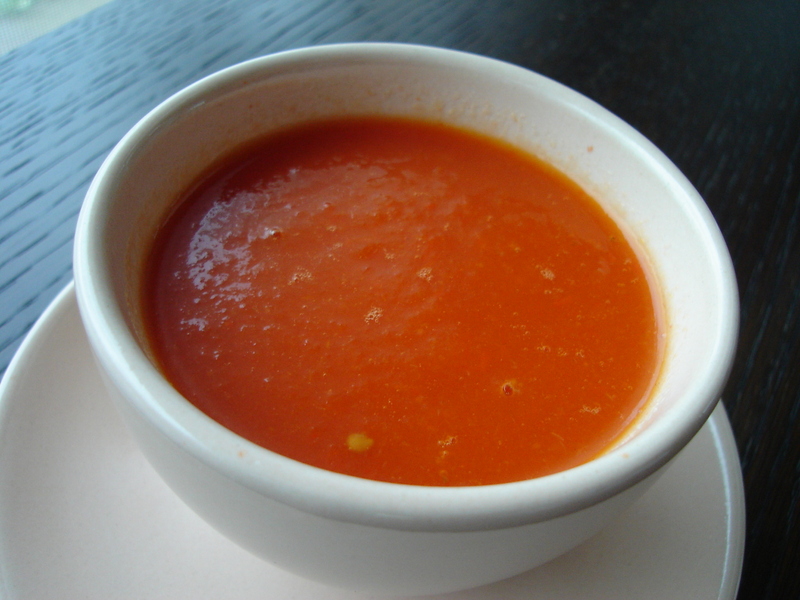 To get velvety soup it is advised to peel the tomatoes. If you are pressed for time, you can skip this. The combination of a green en red paprika gives the soup a bitter touch. If you rather have a softer taste, use 2 red paprikas instead of 1 green and 1 red. This soup is really a diet recipe I got from my sister in law, but the flavours and the consistency are so rich that I’ve served it on family diners as well. Nobody every dared to assume this was zero calorie. If your kids don’t like vegetables but they do like tomato soup with meat balls, then this is a perfect veggie boost in disguise… just make sure they never see you add all these ‘bad’ ingredients.